Before you go buy a tablet, you should ask this question: “what am I going to use this tablet for?” This seems like common sense, but really, take a moment. What are you going to do with that slab of internet-connected screen? If your answer is I need “something for making life-like 3D animations and playing graphics-heavy games,” I’m impressed. You are obviously a power user and need something more top-of-the-line. Please, see iPad Pro. But that’s not everyone. Most people just need a screen a little bigger than a phone; something to throw in your backpack, live on your coffee table, or be a handheld display for watching movies on flights. 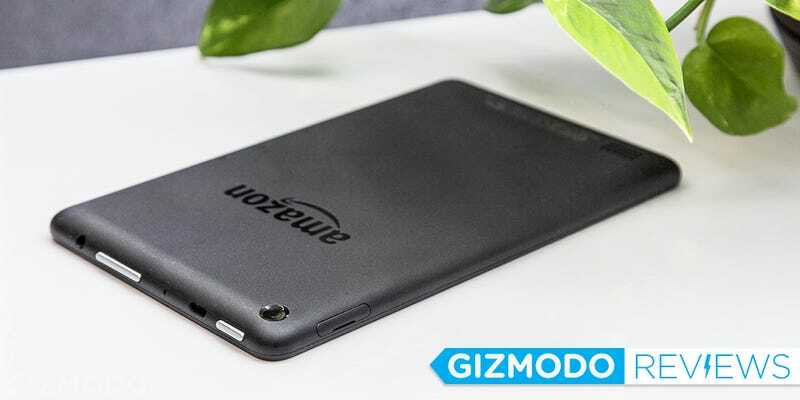 I’ve spent the last few weeks using Amazon’s almost nonsensically inexpensive $50 Fire tablet, and for all its drawbacks—and there are many— this is all the tablet I really need. 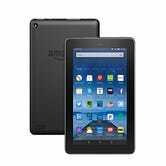 Last year, Amazon introduced the idea of a super cheap usable tablet with the $100 Fire HD 6. With the new Fire—yup, just plain Fire—the company is taking this idea even further with perhaps the most barebones device you’ll ever find on Gizmodo dot com. The tablet has a 1024 x 600, 7-inch display, so we’re talking sub-HD here. Just for a point of comparison, the 7.9-inch iPad Mini 4 has five times more pixels in its display (at more than 5 times the price). Real talk: It’s not a beautiful screen. The colors are dull, even at its brightest setting. The screen lives in a cheap, snap together plastic shell, but it’s pretty durable. I dropped the tablet onto a tile floor almost immediately after I got it, and it survived the harrowing encounter. That drop could’ve meant RIP for an iPad, so despite its cheap feel, the tablet’s pretty sturdy at least. The Fire also has big bezels on all the sides of that less-than-stellar display, but despite the common belief that no bezels is preferable, I actually like them. They give you a nice hunk of glass and plastic to grab, so you can comfortably one-hand the device and not obstruct your latest Netflix binge. Moreover, I like the black border, which serves as a kind of envelope to help focus your attention on the content you’re consuming. And, yes, this device is all about consuming content. You won’t do much with it at all. People are right to point out that Amazon devices aren’t so much open playgrounds as they are portals to Amazon services. The company’s Android-based Fire OS is basically a digital Amazon shopping mall. You’ve got ads on the lockscreen, the homescreen, and in apps. At every turn, the company is trying to sell you something. This is totally fine if, like me, you use a lot of Amazon services. A less cynical way to understand this onslaught of ads is that the Fire tablet is a cheap way to take advantage of the Amazon services I already pay for, specifically, Amazon Prime Instant Video. As with other Fire tablets, you can download Prime content for viewing offline. (Netflix and Hulu are right there for you too, if you want.) You’ll want to use headphones though because the built-in speakers are garbage. But really, I spent most of my time on this tablet reading books, and for that purpose, the Fire is more than sufficient. It’s not quite as nice as reading on the Kindle Paperwhite, and if you try to read for hours and hours, your eyes will start to burn. But remember, the Fire costs $70 less than Amazon’s lovely ereader. In fact its $30 cheaper than the most basic model. The battery life on the Fire tablet is good enough that I only need to charge it every few days. If you spend a lot of time watching video, you’ll need your microUSB tether daily. But what the tablet fails at completely is being any kind of reasonable tool for getting work done. Its performance is all lag, and even a simple task like internet browsing is miserable. Of course, it’s not particularly easy to do much besides consume media on an Amazon tablet, since there’s no Google Play Store. There are workarounds that will allow you to use your regular apps, but it’s not worth it. Even if you can load a big game like Dead Trigger 2 on to the Fire tablet, you probably won’t want to. In other words, don’t expect any miracles from the Fire tablet. It is an entirely functional but very limited $50 device. It’s almost a throwaway, but for $50, you won’t be disappointed. Amazon treats these tablets almost as if they’re supposed to be disposable. Hell the company even has a buy-five-get-one-free six pack. When you destroy one, you just break out another. Amazon could be on to something here, and it’s possibly pioneering an emerging class of inexpensive tablets. You see, tablets in general are gadgets that cost too much money. I understand spending a lot of money on a computer or even a phone, because thee are essential tools you use every day. But a tablet is an extra device. I don’t want to spend $500 on a tablet. I’m not sure I even want to spend $200 on a tablet. Which is why future of tablets isn’t just a premium slab that costs as much as a computer. It can also be a throwaway impulse buy you find in the checkout aisle.